Video poker is not a game of mystery. It wears its odds on its sleeve – or its pay table. Still, the inner workings of the game mystify many players, and my email often includes questions about video poker basics. Some points are raised over and over again. 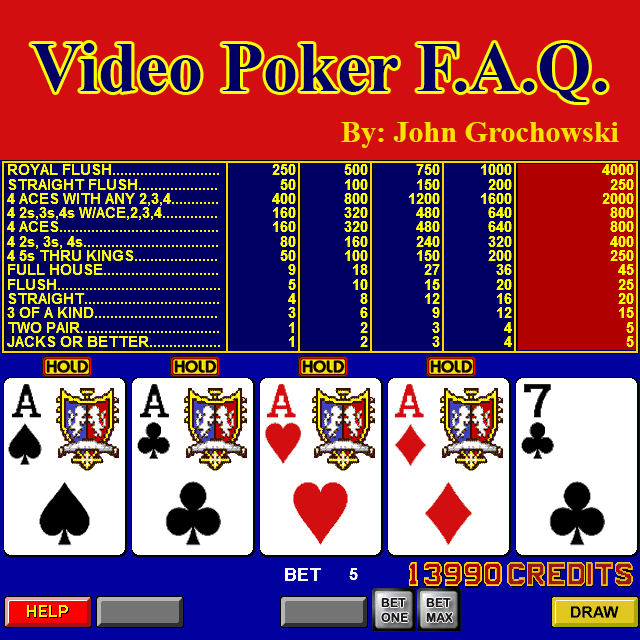 Let’s explore the answers to some of the most frequently asked questions about video poker. FAQ No. 1: HOW CAN YOU TELL A HIGH-PAYING MACHINE FROM A LOW-PAYER? Because every card has an equal chance of being dealt on every hand, we can calculate odds and returns on video poker games just by looking at the pay table. Games with higher pay tables have higher payback percentages. In games that don’t use wild cards, the most frequent way to adjust payback percentage is to change the return on full houses and flushes. Some Jacks or Better games pay 9-for-1 on full houses and 6-for-1 on flushes. Those are referred to as “9-6” Jacks or Better games. Sometimes you’ll see full houses pay 8-for-1 and flushes 5-for-1. Those are “8-5” games. Each unit payback change on full houses and flushes makes a difference of a little more than 1 percent. So while 9-6 Jacks or Better returns 99.5 percent with expert play, 8-5 Jacks or Better returns 97.3 percent, reflecting one-unit drops on two different hands. FAQ No. 2: HOW ARE THE CARDS DEALT? This has evolved over the last 35 years or so, and even today it can vary from game maker to game maker. The most common method of dealing video poker cards today involves a random number generator determining your initial five cards. Once that’s done, the remaining 47 cards are continuously shuffled – that is, the RNG constantly generates new numbers that correspond to the next five cards at the top of the deck – until you hit the draw button. Then the cards you receive on the draw are those at the top of the deck. Previously, the first 10 cards all were determined at once. After you decided which of the first five cards to hold, you’d hit the draw button, and you’d receive the requested number of cards off the top of the deck, but they weren’t being reshuffled until that point. Going back even farther in time, 10 cards were dealt at once, with the possible draw cards existing as a shadow hand behind your first five. Using that method, if you discarded the first card on the left, the draw card would be the shadow card from that same position. The middle card could be replaced only by the middle shadow card, and so on. With any of these methods, the odds of the game are the same. The method of dealing does not affect video poker strategy. FAQ No. 3: Does your strategy really matter? Video poker is a game that blends chance with skill, so yes, your strategy matters. For an example, let’s turn to 9-6 Jacks or Better. The breakthrough game that turned video poker into a popular favorite at the end of the 1980s. Imagine you’ve been dealt a Jack of spades and four hearts – the 10, 9, 8 and 4. **You could hold the Jack and discard the others. If the draw brings another Jack, you get a 1-for-1 payback on a high pair, and better draws will bring bigger paying hands. **You could hold the four hearts. Drawing any of the other nine hearts would bring a flush and a 6-for-1 return. **You could hold Jack-10-9-8. Drawing any of the four Queens or four 7s would bring a straight and a 4-for-1 return, and pairing up the Jack would bring that 1-for-1 payback. We decide by considering all possibilities. If you hold the Jack alone, there are 178,365 possible draws: 45,456 would pay 1-for-1 for a high pair, 8,874 would bring 2-for-1 for two pairs, 4,102 would bring 3-for-1 for three of a kind, 548 would bring 4-for-1 for a straight, 491 would bring 6-for-1 for a flush, 288 would bring 9-for-1 for a full house, 52 would bring 25-for-1 for four of a kind, three would bring 50-for-1 for a straight flush and one would bring 800-for-1 for a royal. The average return for holding the Jack alone: 2.3965 per five credits wagered. If you hold the four hearts, there are only 47 possible one-card draws. Nine of them would bring the flush and the 6-for-1 return. The average return for holding the four hearts: 5.7447 per five credits wagered. If you hold Jack-10-9-8, there are 47 possible one-card draws. Three will bring 1-for-1 for a pair of Jacks, and eight will bring 4-for-1 for a straight. The average return for holding four parts of the straight: 3.7324 per five credits wagered. The results of any one hand are strongly influenced by chance. Your play either works, or it doesn’t. But you’ll consistently add more to your credit meter if you always hold four to the flush in this situation. That part of the game is skill and knowledge, and your strategy makes the difference. FAQ NO. 4: HIGH CARD OR LOW PAIR – WHICH DO YOU KEEP? Low pairs are better starts than most video poker players realize. They’re a much stronger start to three of a kind, four of a kind, and full houses than single high cards are. Let’s use the popular favorite 9-6 Double Double Bonus Poker this time. Dealt 6 of diamonds, 6 of hearts, King of clubs, 9 of spades and three of diamonds, the average return if you hold the 6s is 3.5643 credits per five wagered. If you hold just the King, the average credit return is 2.1553. You’ll win more often if you hold the King. Only 28.7 percent of hands bring a return if you hold the 6s, while you get something back on 33.5 percent of hands if you hold the King. But you get more big payers if you hold the 6s, and that leads us to the higher average return. Don’t underestimate the low pairs. They’re better at preserving your bankroll than are unpaired high cards. If you are looking for additional Video Poker tips and strategy from John Grochowski, check out our “Pro’s Perspective” section in our Video Poker Tutorial.